Debi Larson, owner of Baskets & Beads located in Park View, Iowa was the only entry in the String of Hearts contest. Her innovative use of the design would have been hard to beat, though! 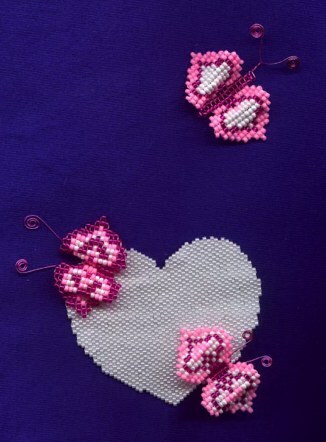 She worked the hearts on wire using the Victorian method for making beaded flowers; then turned them into butterfly wings. Two of her butterflies are attached to the heart pin & the third butterfly may be pinned to flutter nearby. I have dabbled in all sorts of crafts since my teens. 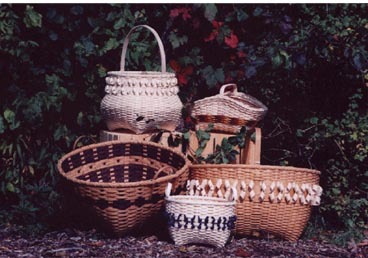 In 1990, I started basket weaving. More recently I have served on the boards of both the QC Basketry Guild, as newsletter editor, and the Mississippi Valley Quilter’s Guild. 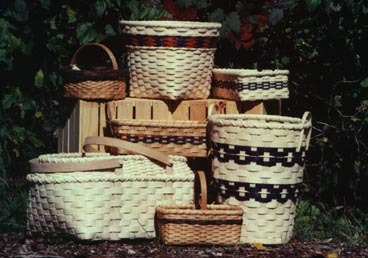 I teach beading classes at Basket Werks in Long Grove, IA, co-chair a bi-state commemorative basket weaving event, and I am superintendent of the Basketry division at the Mississippi Valley Fair, Davenport, IA. My baskets may be purchased at the Broom and Basket Shop in Amana, Iowa and at the many craft shows I do each year (listed on my web site). Beadwork is also for sale at my shows. Mail order is possible, but I really like people to see what they are buying.